In this version we added ability to set microphone record on alarm sound. 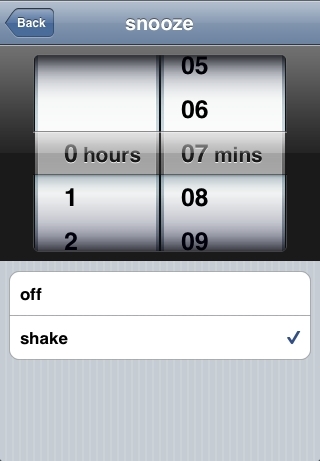 Also we added option shake to snooze. Many users like push button snooze on usual alarm clock and we give to you this possibility. For activation this function you need set requered time for snooze in options of alarm clock. And when you alarm clock starting just shake you device. In this version alarm sound will start more gradually. It give you more easier awake. Also we removed option “ignore silent switch”. Now EasyWakeup ignore silent switch always. Finally we added initial statistics mode. Now you can see how many hours did you sleep. Some more data will be added in future. Many bugs was fixed. And added check audiosystem on start alarm clock. If something wrong with your audio you will know about this before dreaming. you can use insomnia or backrounder to use the free version of this dumb app with the screen turned off. This method does not work. App awake you only on last time from predefined interval (in any lite version). How would you actually attach the phone to you and still be able to sleep at night without breaking it? I don’t know why do you think about breaking. I’m sleep with iPhone 4 month and have no any problem. Look here http://easywakeup.net/content/how-attach-iphone to see ways to attach device. The iPhone isn’t so fragile that it would break smashing against soft pillows and blankets. Yeah but how about underneath a 150 lb person? Why are you protecting this bad app? This is not a bad app! I use it every night and it really improved my mood in the morning. And don’t worry about breaking your phone. Its atached to your wrist and it’s safe there as long as you don’t hit the wall at night with your wrist. It’s suggestion. But i have practice. Of course i rolls around too. Just because you dont find it useful does not make it a bad app. There are millions of people with sleeping issues. If you do some research, you will find that sleep goes in sleeping phases / cycles, Each person’s sleep cycles range from 60-120 mins but it is different for each person. If you wake up during a cycle you feel all tired but if you wake up after a cycle you feel rested. There are a lot of documented studies on this. I find this app’s solution to the problem to be both innovative and unique. It uses movement to determine if you are mid cycle or at the end of a cycle and wakes you up close to your estimated wake up time but makes sure you’re not mid cycle. There is definitely nothing bad about it. People that cannot sleep pay a lot of money to solve those issues. It would be much cheaper to buy a spare iPod touch and this app just for this purpose. The app is not for everyone. Many people sleep fine and wake feeling rested. Obviously those people don’t need help. But for insomniacs or those that just want to wake feeling more rested, this app is a good alternative to some of the more expensive solutions out there. Even if you got a separate iPod touch for it leaving your iPhone charging all night, then you would have a $250 solution compared to the other solutions in the thousands of dollar ranges. Anyways, iPhones aren’t so fragile that they’ll break under a person on a cushioned bed. It would require you to be thrashing all night long smashing it against a wooden head board, for example. Anyways, what makes an app good is not whether or not every one can use it. Instead, it is if the app solves a particular problem or not. There are good graphing calculators in appstore, but not everyone needs a graphing calculator. That doesn’t make them bad apps. This particular app takes a very unique approach to a very specific problem. If you have problems with sleep, I suggest you give it a try. If not, pass it up. Don’t bag on the developers though because you dont find the app useful. That’s silly. Has anyone the retail version?